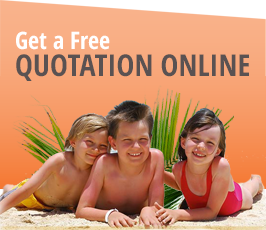 Family-run hotel with over 50 years of experience in the hospitality industry. In our hotel in Cervia you can enjoy all the comfort of a holiday on the Riviera Romagnola. The family-run hotels are chosen for the courtesy and the listening to customers in every request. Our mission? "The customer is always right". Services and facilities for a nice and relaxing holiday. In Pinarella you will experience "not only Sea holydays" .. You will have many opportunities to enjoy yourself: cultural entertainment, sports on the beach and in the hinterland and immerse yourself in breathtaking landscapes. Large shady garden with children's play area. Our motto? THE CUSTOMER IS ALWAYS RIGHT. Since 1963 Hotel Milena has been run by Casadei family, in business for 50 years, in full respect of local traditions. The hotel is located in a quiet area, a short walk from the town centre and from the sea, reachable by a lush pinewood. 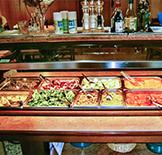 Our impeccable cuisine will surprise you with daily menu choice, every day fish course, breakfast and vegetables buffet. For the little guests meat and vegetable stocks, on mother's request. Available high-chairs for the dining room. Small basins for baby bath and bottle warmers. All the spaces are air conditioned. 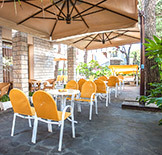 The spacious lounge bar communicates with a shady garden equipped with a play area for children. Fenced and lighted private parking.